Every month seems to bring a report of a new fossil from the Jurassic or Cretaceous period rocks that show evidence of feathers. This deluge of new fossil finds will not end because there are as many fossils under preparation for publication as have already been published. Just considering the fossils already revealed to the public it has become increasingly evident that many lineages of dinosaurs had some form of feathery plumage even if they were not covered by flight feathers. Young earth creationists have reacted instinctively to each new fossil by attempting to neatly categorize them as either dinosaurs or birds but have found themselves at odds with each other about how to sort these fossils into separate “kinds.” Most recently the discovery of feathers trapped in amber that are attached to a bony dinosaur tail has reignited the young-earth communities angst regarding the strengthening connections between birds and dinosaurs. Did dinosaurs have feathers? In a biblical worldview, we do not expect to find feathered dinosaurs. Currently the evidence does not support the idea that dinosaurs were covered in feathers. Now while we may not know for sure what dinosaurs looked like, what we do know is that birds did not evolve from dinosaurs. I had to ask myself upon reading this “how does a biblical worldview inform us that dinosaurs didn’t have feathers?” Why couldn’t they have had feathers? Foley seems to assume that the defining characteristic of a bird is having feathers and thus it would be impossible for a dinosaur to have them. Why? My bible does not define birds as the sole group of animals with feathers. In fact my bible does not even define the flying things as synonymous with what scientists call birds since bats and pterodactyls also fly and they lack feathers. Why couldn’t God have made some dinosaurs with feathers? Even if most dinosaurs did not have feathers that would not preclude some dinosaurs from having them. Foley follows here definitive statement about feathered dinosaurs with “we may not know for sure what dinosaurs looked like” and yet her biblical worldview is somehow informing her that dinosaurs would not have had feathers? I’m very confused. Adding to the problems with evolutionary ideas about bird evolution is the fact that modern birds like parrots, loons, and owls are found in the fossil record in some of the very same layers as dinosaurs. How could modern birds have evolved from dinosaurs when modern, fully formed birds are found alongside dinosaurs in the very same layers? Leaving aside the fact she has her facts wrong in this paragraph (modern parrots, loons and owls are NOT found in the same layers as dinosaurs), the paragraph above contains a common argument found in the YEC literature which repeats a classic misconception of evolutionary principle of common descent. Her argument is akin to claiming that evolutionists believe that if domestic dog bones are found in the same cave with those of wolves this would be proof that domestic dogs could not have evolved from wolves. Or the more common manifestation of this argument can be found every day on Facebook in the statement – if man came from apes, why are there still apes around today? Creationist organizations have, to their credit, warned their readers that this particular man/ape argument is fallacious and is a misconceptions of what evolutionary theory says or predicts. Foley’s use of this misconception, though, is especially egregious, and somewhat humorous, for two reasons. The first is that Answers in Genesis published her article apparently without realizing that she was propagating the same misconception that they claim they are aware is fallacious. This suggests a lack of editorial oversight by someone in their organization. The second is that Foley had written an article just five weeks earlier entitled “Creationists Misconceptions about Evolution” in which she specifically addressed the creationists’ misconception “if we evolved from apes, why are there still apes today?” So, five weeks later she pens an article for AiG in which she directly applies the very same fallacious argument she just warned creationists about using. Foley’s contradictions in her own writing are ironic but not surprising. It is obvious that Foley did not actually understand the biological concept behind the misconception. She was simply reiterating statements that she had read in creationists literature. She only knew that this particular example was not true but didn’t understand why. So when she wrote about birds and dinosaurs she did not recognize that she was falling victim to the very same error. The creationists’ literature is replete with similar examples of contradictory statements. Why? Because most of these writers have very little scientific training, have never been involved in research and grew up on creationist’ literature rather than being exposed to original scientific literature. As a result, they frequently don’t understand biological concepts but have just memorized some facts some of which may not even be true or are outdated. Avery Foley describes herself as having a “Bachelor of Science in Religion from Liberty University and am working towards my Masters of Theological Studies from Liberty Baptist Theological Seminary.” Her lack of background knowledge and research of the subject she is writing about is very evident in her articles. She has been given a larger writing role for AiG in recent months often responding to articles about recent evolutionary biology discoveries. She has no scientific training at all but she is tasked with providing scientific answers for a large audience. It is unfortunate for the Christian community that this is what passes as creationists’ scholarship. In another article written by Foley a few months earlier she began by stating “Those who don’t buy into evolutionary dogma are often laughed out of scholarly circles or accused of being anti-science or even anti-intellectual.” I won’t go that far but I will say that when one’s writing demonstrates a high level of scientific illiteracy it is not unexpected that a certain amount of justified criticism should come your way. This is an updated version of an article I wrote in the summer of 2015. I am intrigued, having read about the latest mini-therapod (the size of a sparrow) with the feathery verterbate tail. 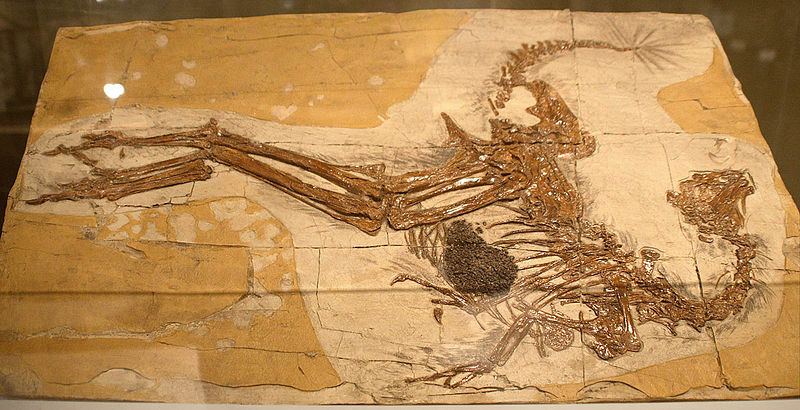 My question from your article is about the Foley statement “Modern birds like parrots, loons, and owls are found in the fossil record in some of the very same layers as dinosaurs.” Is this true, and how should it be interpreted? It seems to say there were birds around 100 million years ago. Ah, yes, I suggested there was a factual error in her statement. Nothing that you would recognize as a modern parrot, loon or owl today has been found in 100 million year old rocks. There is a report of a fossil beak that is clearly of a parrot that is 70 million years old. Phylogenetic studies sequencing DNA suggest that some of the major groups of birds had ancestors that go back to just before the K-Pg extinction and so there were birds that had many similarities to some modern groups at that time living with dinosaurs. She uses the word “modern” to make the audience think that there birds didn’t change over 100 million years but we could say modern in the sense that ancestors of modern major lineages of birds did exist. Regarding parrots, the specimen described a number of years back is indeed quite parrot-like. But, it is not nearly universally accepted as a parrot by paleontologists — it may be from one of the toothless bird-like dinosaurs common at the end of the Cretaceous, or from another type of bird altogether. The most widely accepted “stem parrots” are from a bit later, ~52 million years ago (we have one on display in my museum right now, in fact!). There is a really handy paper by Ksepka and Clarke, two experts on avian paleontology whose work I trust, talking about the oldest definitive parrots, etc. It’s worth noting that they also peg the first owls post-dinosaur extinction. Previously reported Cretaceous owls are now definitively accepted as non-avian dinosaurs. And you’re spot-on that even if some lineages extended back to the Cretaceous, they aren’t much like the ones we have today. Thanks for the details. I was going on some old memory of having read about that parrot fossil. What Folley (and AiG by extension) have done here is exactly what I have said is the problem. The find any report that provides a pieces of evidence they can use and then everyone everyone after that just copies what that first YEC author says. Avery Foley almost certainly knows nothing about those original reports in the palaeontological literature but had read in a YEC article somewhere about a parrot being found and then just assumes this is a fact. I can understand that Foley doesn’t have enough expertise to evaluate the YEC literature but her article must have also passed through some editors hands like Dr. Snelling. “Bachelor of Science in Religion from Liberty University” ??? What is this? Isn’t the normal degree called a “Bachelor of Arts in Religion?” weird. As an old-earth creationist, I have no problem with the abundant evidence for feathered dinos. Like human designers using characteristics of both a fork and a spoon to make a spork, God re-uses design characteristics multiple times in different species. Dinosaurs as a whole seem to be a type of creature that possesses a mix of bird and reptile characteristics (mostly bird). Yes, that would be because modern birds are descended from dinosaurs. You often say “as an old-earth creationist” as if that had some merit to it. While it’s good that you acknowledge the age of the earth, you’re still baselessly rejecting the overwhelming and exclusive evidence for common ancestry. There is no evidence which would cause anyone examining it to think that species do not share a common ancestor. In other words, while you’re less wrong than YECs, you’re still wrong, and demonstrably so. I don’t claim merit to my position. No position has that right, that would be a (very strange) form of appeal to authority. I simply choose to give my opinion from my perspective, as OEC are severely underrepresented here (it’s mostly just evolutionists and YEC). As for your claim, I would say evolutionists are wrong and demonstrably so. But saying that doesn’t make it so. For either of us. I reject evolution because I find the arguments against it and for supernatural design to be more compelling than the arguments I have heard for it and against design. Then demonstrate it. This entire blog consistently demonstrates why it is true. There is no evidence whatsoever which, upon examination, and in the context of all other available evidence, would lead anyone to think that species do not share a common ancestor, and literally all the available evidence which suggests that they do. Being concerned that OEC is underrepresented here is like being concerned that geocentrists are underrepresented on a blog devoted to refuting the claims of flat-earth geocentrists. The position is still 100% unsupported by evidence, just not quite as badly as the main target of the blog.